"There are no hot lights shining in my eyes, no microphones being held up to my face, and no screaming media people barraging me with questions. It's just you and me." 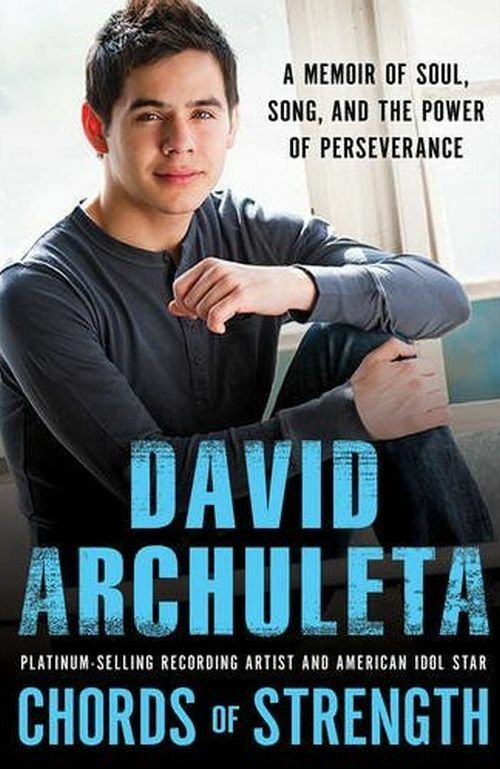 If you haven’t read David Archuleta’s book, Chords of Strength, yet, you might want to avert your eyes and return to the home page. If you have read it and want to share your impressions, thoughts, feelings or favourite parts, you’ve come to the right place. As more readers get a chance to finish the book, we’ll be adding to this main post, but please feel free to comment below. I read the book straight through in two sittings … couldn’t put it down. I started out thinking I’d stick Post-it notes beside my favourite parts, but quickly realized I’d have to cover the whole dang thing! My biggest hope for the book was that it would capture David’s unique voice, his Davidness … and boy does it ever. That said, there are definitely some phrases and descriptions here and there that likely came from the ghostwriter (can’t quite picture David penning “exponentially more extreme” (p. 38), but who knows). Overall, however, this is definitely David’s story told David’s way. My favourite parts are when he talks about the spiritual power of music and the communion between singer and live audience. Goosebumps, baby, goosebumps. And I also loved the insights he offers into the nature of fandom. These are mysteries we’ve been struggling with for two years, and to know that he’s been asking the same questions and actually arriving at some fairly astute conclusions, left me reeling … I had to reread those pages again and again. In fact, I need to read the whole thing again. How about you? Is it what you expected? Did it hold any surprises for you? Do you have one favourite part? Two? 65? Have a great day Snow Angelz! Hope everyone enjoys sharing a “one on one” with David through his book “Chords of Strength”. Gosh, so many fave parts…. TOfan> what you said about “mysteries we’ve been struggling with for two years, and to know that he’s been asking the same questions and actually arriving at some fairly astute conclusions, left me reeling …” The fact that he “gets” us as much as we get him…. I’m … well, amazed and grateful…. and need to read again. Finally read it. I don’t even have words. I also couldn’t put it down. I found that I was so into the book, reading everything he had to say, when I would see a picture of him on the next page it would kind of snap me out of it and I would be like “oh – this is David”. Like obviously I never forgot it was him but I don’t know. It kind of made me see him as more of a real person. It was bizarre. I have so much more to say but can’t remember right now! Haha maybe I need a reread! i haven’t finished the book yet but I am almost done. I really like this book a lot. He has a lot of the same priciples and believes in the same things as me (God and His wonderful power). He is definetly someone I would want to become friends with. I like how he keeps reminding us that he dosen’t care about fame or money. He likes the feeling he gets when he performes for an audience. He likes that connection. The connection is more powerful to him than being famous. He is just a over all sweet, humble and genuine guy. He would never do anyting bad. I have been through Chords of Strength twice, and I absolutely love it. However, I am trying to find where the quote on the back came from, because it’s not in the book. I figure it was probably from an interview or something. Any ideas? Kirsten….I absolutely adore the quote on the back of the book too and I am under the impression that it was meant for the book but probably was decided to put it on the outside of the book on the back cover. It certainly draws your attention and interest. peppertara – Thanks for replying to me! I agree 100% with everything you said. Maybe at some point I’ll write a review of the book that’s more than “I absolutely love it.” There are so many wonderful aspects of the book that it’s hard to put into words or decide where to begin. My third time through might be my slowest, just so I can take it all in. Plus, I am SO EXCITED for the next album! I haven’t read the whole book but up to now it has been inspiring and interesting to read all the experiences he’s had with his singing career. I was able to go to his book signings and get two copies signed yey!! and hear him sing for the first time it was so amazing-0- Saw him in person for the first time and he is sooooooo much better looking in person so cute and beautiful eyes!! !